The new year is a time to celebrate with loved ones, to start fresh, and to make resolutions. If you’re already a vegan, now is a great time to make a resolution to stay vegan and perhaps add something extra to your vegan journey. Join NARN, start (or attend) a vegan supper club and meet other vegans, raise funds for an animal organization, or maybe step out of your comfort zone and get involved with activism. The NARN calendar on our home page has all our upcoming events on it, including social nights and fundraisers, as well as demos and leafleting events. If you’re not vegan yet, try it for a month. Veganuary.com is a great place to start. You can also look on Amazon.com for vegan cookbooks like How it all Vegan and The China Study Cookbook. Websites like the Post Punk Kitchen or Engine 2 Diet are great resources, and a web search will result in a ton of links to vegan recipes. You might find being vegan is fun, easier than you thought, and makes you feel good about your health and all the animals your not eating. On a trial run, take the time to read about the plight of animals. Often, the easiest time to learn about what animals endure for our taste buds is when you’re not partaking in them. No guilt. No excuses. Just learn and be the change. If you need help, here’s a link to a previous post about how to transition into veganism. And you’re always welcome to take part in NARN’s vegan mentor program. The future is vegan! Happy New Year! World Vegan Day was started in 1994 to celebrate The Vegan Society’s 50th anniversary. The Vegan Society formed in the UK in 1944. That was the year that the term “vegan” was coined and defined. Vegans abstain from animal products. Food wise, that means meat (including fish), eggs, and dairy. Veganism extends to other areas as well. Vegans don’t wear animal products (fur, leather, wool, silk, feathers, or any other item from an animal), or use household products containing animal ingredient or products tested on animals. Vegans don’t support captive animals acts like those in the circus or SeaWorld. Vegans view animals as the sentient beings that they are, and not commodities to be exploited and used by humans. You can read our Vegan FAQs for answers to many questions about being vegan. November is World Vegan Month. A perfect time to go vegan. One way to start your journey is by ordering a vegan starter pack. Several organizations have packs to help you get started. The packs include things like recipes, nutritional info, and compelling reasons to go vegan. If you’re already vegan, and need a bit of support, you can join the vegan mentor program, which matches new vegans with established vegans so you can make a smooth and lasting transition to veganism. It’s nice to know you’re not alone in your quest for a cruelty-free life. So whether you’re just thinking about veganism or you’re well on your way, World Vegan Day is a great time to make a commitment to the animals, the earth, and your health. For those of you wanting to make a transition to a vegan lifestyle, breakfast can seem problematic. 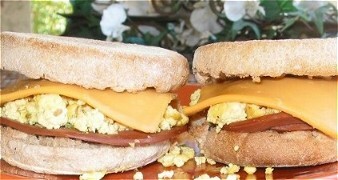 After being raised on a diet of sausages, scrambled eggs, pancakes, and the like, you may not know where to start; substituting soy-milk for milk is easy enough, but what if you are in the mood for an egg muffin sandwich? Vegan Coach has compiled a list of tried-and-true vegan breakfast recipes that are both healthy and fulfilling enough to jump-start your day, everything from French toast, vegan sausages, pancakes, and yes, even an all-vegan “egg” and “ham” muffin sandwich! If you’re a scrambled egg lover, try the scrambled tofu recipe. You’ll love it, and after the third time, your taste buds will be accustomed to it and it’ll be your new scrambled eggs — and more enjoyable, since you don’t have to push out the dark thoughts about how the food ended up on your plate. Finally, breakfast you’ll look forward to waking up for! Welcome once again. I hope that those of you who are with our Vegan Mentor Program have been able to continue on your path either on veganism or working towards it. One concern that some of you have mentioned is in finding vegan recipes that are not only easy, but also inspire you to be in the kitchen to cook. Popular food blog The Kitchn has compiled what they feel are the top 10 most inspiring vegan cooking blogs, with appealing layouts, beautifully presented photos that make you hungry just looking at them, and humor and character from the authors. And The Kitchn has been featuring quite a few vegan recipes on their own, and they’ve also compiled what they feel are the top 25 vegan recipes from their own archives, from breakfast through dessert. Take a look around and I guarantee you’ll find something which will inspire you to zip into the kitchen and break out those pots and pans! Happy cooking! Give vegan cooking a kickstart! With the start of 2011, NARN has rolled out a new campaign that we are excited about, the Vegan Mentor Program. Much effort has been made by many people to spread information and increase the awareness of the benefits of a vegan lifestyle, but there has to date been very little done to ensure that once people go vegan, that they stay vegan. So that’s where the Vegan Mentor Program comes in; once you pledge to be vegan, we will match you up with one of our Vegan Mentor volunteers who will give you personal one-on-one support on the practicalities and principles of veganism. They will give advice, lend an ear, and give you direction to resources that will help you overcome the inevitable hurdles along the way. Through this blog, we will also offer other hints and tips to help you stay vegan as well. They will be filed under the category “Vegan Mentor Program” to the right, so you can go through all the other posts we will create. Now, obviously, the first concern of people who are new to veganism is what to make. In the kitchen, you’re likely accustomed to certain recipes, techniques, and habits, and cooking vegan meals may seem hard to plan for. Well, some of the hard work of figuring out what to make has been done for you! The Physicians Committee for Responsible Medicine (PCRM) has a 21-Day Vegan Kickstart program with easy recipes, shopping lists, and tips that you can use so you don’t have to fret about what to make each day. After the 21 days, you will have acquired a new routine of cooking vegan meals and you can be more confident branching out with planning your own meals, trying out new recipes, and experimenting more with a wider array of ingredients you’ve never had before. So check it out, and have fun in the kitchen!